Line cookie sheet with cooking parchment paper; spray paper with cooking spray. Wash and dry apples; remove stems and blossom ends. Insert twig or wooden stick into stem end of each apple. In 2-quart heavy saucepan, cook sugar, water and corn syrup over medium heat, stirring occasionally, until sugar is dissolved. Cook about 8 minutes, without stirring, to 300°F on candy thermometer or until small amount of mixture dropped into cup of very cold water separates into hard, brittle threads. (Watch carefully so mixture does not burn.) Immediately remove from heat; stir in food color and cinnamon oil until blended. Dip each apple in syrup, tilting pan and turning apples quickly to coat evenly; allow excess syrup to drip off. Place apples on cookie sheet. Let stand until set. 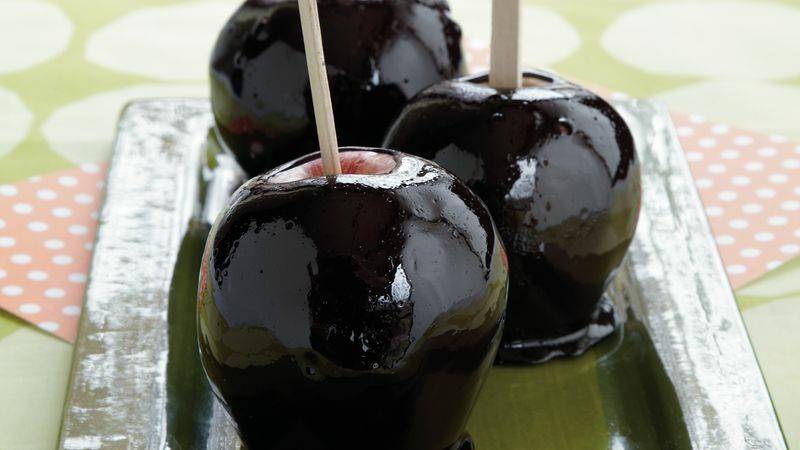 Change the shade of these candy apples by substituting other colors of paste food color.